After I did Tuesday's and Wednesday's tasting I was left somewhat puzzled by the lack of enthusiasm I felt about the two a'bunadhs. They were good enough for 80+ scores, but nothing I'd buy. I've always liked cask strength sherry bombs, even when I didn't like sherried whisky in general. That big rich assault used to appeal to my senses. And now it was not. Was it the whisky or was it me? 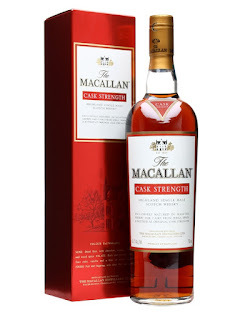 Macallan used to make cask strength whisky, sometimes it was 10 years old, sometimes it was not. I found two batches very astringent and sour. I found another two batches pretty decent. And the old all-red label stuff was awesome. At some point, Florin gave me a half bottle of one of the last editions because he didn't care for it. I liked it enough that I bought a bottle when I found it for its original price at a local store. And then Macallan discontinued the Cask Strength line entirely. I saved a couple samples of that stuff and swapped a couple more out in then forgot about it. Then came a very positive My Annoying Opinions review of one of the samples. As you may know, it's difficult to wow MAO, so his positive take on it made me consider doing my own review. And it took only 13 months for me to call this audible and compare it to a fellow young sherry monster. Yep there's the butterscotch in the nose, followed by rich creamery butter. Then barrel char and shoe polish. Mild sherry / prune note throughout. A bit of vanilla too. Toffee and prune-y sherry in the palate. A little spicy zing and a hint of good bitterness. Cherry popsicles. Chocolate cherry cordials and orange sherbet in the finish. Some oak spice in the back. Caramel, loads of rich caramel in the nose. Paint VOCs, new car smell, and musty moldy sherry. Hints of oranges and salty air. Mixed salted nuts, gooey dates, and a little bit of vanilla. It's really easy to drink. I mean, weirdly so. And it's oddly......bourbony, like ND-era Old Taylor (which does taste good). It's a bit woody at times, lots of vanilla. A nutty creamy sherry lingers in the background. The finish dries out, gets the tannins going. Some dark cherries, caramel, and vanilla. Raspberry fruit leather, red Pixy Stix, figs, and anise in the nose. On the palate, the sherry sweetens up, picks up more sugary fruits. A little spicy bite. Slight fizziness, like raspberry Schweppes. The finish is a little acidic and tart. Blackberry and raspberry syrups, and some caramel. The nose has a mustiness that makes it feel like an older dustier whisky. Then a big toffee pudding note. Then walnuts and cashews. A hint of lemon. Dried fruit waaaay in the back. The sugary palate is entirely caramel, sweet cream, and almonds. The finish is sweet but short. Caramel and a woody bitterness. The nose gets sharper, narrower. Less sherry, more barley. Confectioner's sugar and carpet. The palate also get narrower. But it also gets very sugary, like some sort of raspberry candy. The finish is candied and simple. Vanilla and lime. The woody nose does pull out some toffee and dried fruit sherry-like notes. Some ginger, too. Again a very sweet palate. Caramel and vanilla. The finish is short and sweet. First some thoughts about the Aberlour. 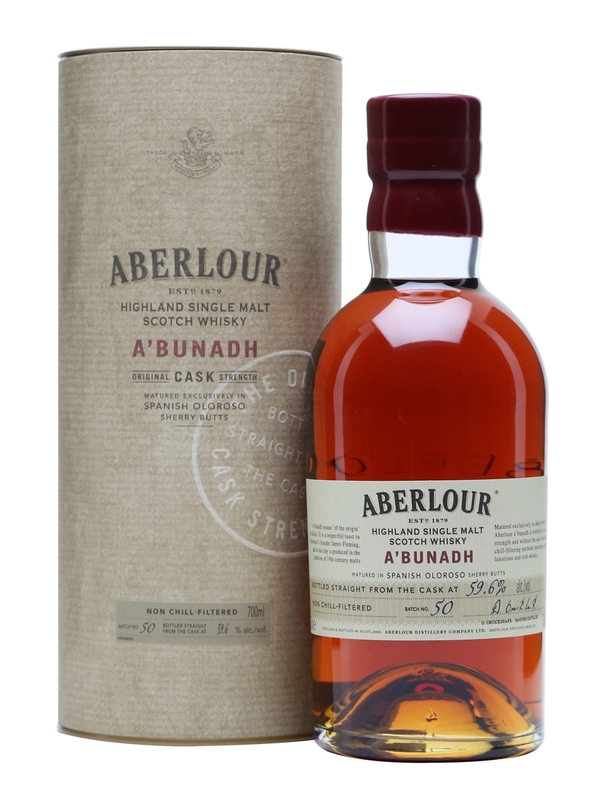 Compared to its sparring partner, the a'bunadh felt more like a classic sherried whisky. There's still the odd butteriness to it when neat, but overall it felt like a better drink than it did in the previous post. It still gets thrown off at the 40%abv point, but not as badly as before. So its score will go up a little. Then there's the Macallan. There is so much caramel and vanilla going on in this CS that it almost seems like one of their Fine Oak releases, which isn't necessarily a bad thing in my opinion. It just caught me so off guard that it took a while for me to appreciate the whisky for what it is. There's much much more sherry in the nose than in the palate. But then there's the fact that it is unnervingly easy to drink at full strength. The nose presents itself as a cask strength whisky but the palate arrives like its ABV is 15 degrees lower. The nose stands up to water well, and though the palate doesn't disappear when hydrated, it doesn't hold up as well. MAO found the same easy drinking phenomenon and caramel notes when doing his review. We discussed the possibility of there being too much oxidation, but I didn't think that was the case. This bottle went pretty quickly. If there was something screwy with my bottle then it did not ruin the experience. Getting past my preconceptions, I liked this Macallan. It's tasty and devoid of all the sour notes that I disliked in other batches. And I liked the Aberlour better than last time as well. So, in a way, this was a success. I found that Macallan CS became very bourbon-y when hydrated down to 45%, so I don't think it's just you. That's good to hear. They've been bragging for years about how much £££ they're spending on European oak casks. This kinda puts a dent in that.